A little over a month or so – that's how long the rumor mill says we have until LG gets up on a stage somewhere and lifts the veil off of its new flagship, the G4. The next LG powerhouse is speculated to be a lot of things – curvy, awfully tech-ridden, and as compact as always (relative to its screen size). But how do the more artistic among us envision LG's upcoming G4? We sought to answer that question, and dug deep before rounding up 5 different concept renders that show us 5 different takes on the device. Most of them seem to be in an agreement over one feature – the back-placed power and volume keys. The rest, however, is up to their own imagination. Courtesy of Ivo Marić, the renders to your left envision an LG G4 with a flexed profile, metal frame, and a premium leather back. We especially liked the protruding camera at the back, for in this instance, it'll actually provide support for when the device is laying on its back, and not allow the G4 to wobble due to its curved rear. Developed by Jermaine Smit, this particular LG G4 concept appears quite real and feasible, considering the company has flexed phones on the market already. The renders keep to a glossy plastic shell, pretty much in tune with the latest rumors that suggest a similar exterior for LG's next, and only deviates from the status-quo with a pair of front-facing stereo speakers. Starting with the LG G2, the company essentially created a new trend – thin bezels. Indeed, so long as some bezel was kept in for support, why wouldn't we want a phone that offers more screen real estate at no cost in terms of physical footprint? This concept render, created by Giztimes, is all about that, and we've got to admit that we're secretly hoping that LG continues pushing on that front. Who said that front-facing stereo speakers necessarily have to get in your face? This concept render imagines a more Sony Xperia Z3-like solution, with more inconspicuous front blasters, and even a novel touch-sensitive strip on the rear for volume control and easy scrolling and zooming. Yet another Jermain Smit creation, this LG G4 concept renders imagine the flagship with a mix of plastic (rear) and metal (frame) with chamfered edges, scoring it some extra premium points. A set of front-facing speakers are, again, part of the picture, but by far the most interesting part of the render is the focus on the camera – a huge, quite conspicuous camera ring that makes a statement. Hey, I have a LG G4 concept as well! LG G4 with no Snapdragon 810. Currently the best option is the 808. I hope they go with the 808 or 805. SD808's memory bandwith halfs as SD805's. It doesn't support UFS 2 fast storage contrary to SD805. GPU's name implied it's inferior to Adreno 420. 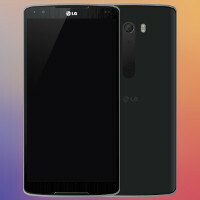 They have released LG G3 LTE-A in Korea with SD805 at mid 2014. However SD810 is crap if they would come up one year old hardware in mid 2015 they will look bad. Their choices looks between bad and worst. Maybe they could have secretly developed a new in house SoC. Or they could try their luck with NVIDIA. X1 has a 5W TDP. It can't be used in phones period. It's for tablets. 805 is decent chip. And Samsung isn't giving UFS 2 to LG anyway until the end of the year. LG can't develop a new chip this soon. I think the choice is between 808 and 805. 808 will have a 20 nm big.LITTLE and adreno 418 is more efficient than 420. I don't think people care about raw power that much. 808 will give better battery life. You are talking about regular X1. When they underclocked GPU to A8X performance level it's power consumption radically reducing. Almost half of A8X's. And it's still powerful more than enough. CPU's power consumption is comparable to Exynos 5433. Shouldn't be a problem to optimizing X1 to smartphones if they could be able to convince NVIDIA to do that and willing to pay it's price. For now Samsung only manufacturer producing UFS 2, but G4 still doesn't coming a couple of months and you know there are other manufacturers around. We don't know what LG doing now after NUCLUN. They could have begin to developing a new chip many months ago. SD801 was decent also, but when Z3 come up with that late, people thought it's kind of outdated. Still the chip is too big and I don't think they will be able to restrict the performance too well. Not to mention the incompatibility of tegra chips with some games. Also Nvidia openly says that they are not focusing on smartphones. But I'd love to see an Nvidia Tegra X1M kinda thingy to compete with Exynos 7420. First render of Flexed LG G4 is superb. G4 Should be like that. Totally agree ! If I was an LG's official, I would have recruited him. based on my source concept 1 is the nearest to truth. just wait and see im sure lg g4 is a beautiful smartphone even better than awarded best of the best reddot design which is the g3. g4 will be the most beautiful and elegant phone of the year. Not sure how #4 has a 588 ppi with a 5.7" QHD phone when the 5.5" QHD screen on the G3 only has a pixel density of 538. Where do you see that? Perhaps I'm missing it, but I don't see any PPI value for #4. Either way, though, you are right. The only way the PPI could approach 588 is if they use that rumored resolution of 2,880x1,620 (doubt it will happen) on an approximately 5.6" screen. "A little over a month or so – that's how long the rumor mill says we have until LG gets up on a stage somewhere and lifts the veil off its new flagship, the G4." Best opening for a phone article ever. render #1 is the right one mark my words. #3 is like a freakin tablet! Snapdragon 810 is a fc*kin HEATER! Conceot number 4 for me is the best since it has the speakears on the front....for me concept 4 then concept concept 5 then concept 1. I'd take #5 any day.